The human olfactory organ is the result of millions of years of evolution and biological refinement. But, in spite of your face, it can't tell the difference between an apple and a pear nearly as well as this mechanical sniffer. First explored in 1982, research into duplicating the human sense of smell in robotic systems (aka electronic noses) has advanced by sniffs and bounds by replicating the biological system. 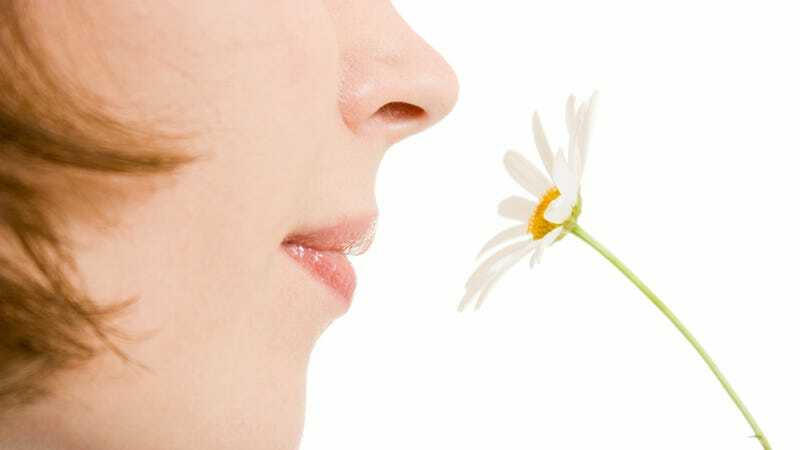 Distinct smells are treated like scented fingerprints, each registering a varying relative value over an array of chemical levels, with no two smells being identical. Electronic noses work much the same way people's noses do, in three steps. First the sample is aerosolized in a Headspace where the volatile compounds that constitute scents are collected. These compounds are then blown into the detection array where they interact with a series of sensors that are typically coated with receptor proteins that respond to specific odor molecules, resulting in a relative electrical capacitance change. The readings from this array are then transmitted to an computer where the digital values are computed and compared to a database of known values for the scent. The apple and pear system developed by researchers from the Polytechnic University of Valencia, Spain, and the University of Gävle, Sweden, uses a series of seven types of sensors—32 sensors in total—each calibrated to a different temperatures range. At lower temperatures foods give off fewer compounds and sensors therefore need to be more, well, sensitive. This data is then analyzed based on three input parameters from each sensor and extrapolated against the known patterns for apple and smells. "The fruit samples are placed in a pre-chamber into which an air flow is injected which reaches the tower with the sensors which are metal oxide semiconductors that detect odorous compounds such as methane or butane," José Pelegrí Sebastiá, co-author of the paper, said in a press release. So, what's a robot going to do with a nose? "One example would be the winemaking sector," Pelegrí continued, "where an electronic nose capable of distinguishing the quality or type of grape or recognising the vintage a wine belongs to would be very useful." While this version won't be making it out of the lab, more advanced versions could one day detect gas leaks in mines, spoiled food in your pantry, even signs of lung cancer borne on your breath.